Western Michigan didn’t want to start 2010 the way it did. The Broncos hosted tenth-ranked Bemidji State and didn’t record a goal in the two-game series. The two teams skated to a scoreless tie in the opener before BSU won the finale, 2-0. In the first game, Riley Gill picked up his team-record eighth career shutout after he made 29 saves. On the other side, Dan Bakala made 31 for Bemidji State. The Broncos won the shootout, 2-1, as Max Cambpbell and J.J. Crew scored. In the second game, the Beavers scored two second-period goals and WMU was unable to convert on a trio of second period power-play opportunities. Bakala made 26 stops for his second consecutive shutout. 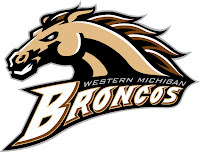 Jerry Kuhn stopped 27 for Western Michigan. The Broncos (6-10-4, 2-9-3-1 CCHA) get set to host Michigan this Friday night before traveling to Ann Arbor Saturday night. Both games start at 7:35 p.m.